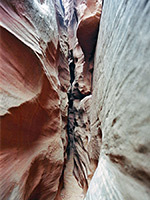 Just two miles east of the four very narrow slots at the upper end of North Wash lie half a dozen equally narrow, steeply descending ravines which form the northern sections of Butler and Stair canyons. Downstream these two are both quite wide, ledgy and boulder-strewn but they constrict abruptly when the drainages reach the Navajo sandstone layer. Butler splits into five branches, each narrow for around half a mile or more and all needing rope-assisted climbing to explore fully though as usual much can be seen without. 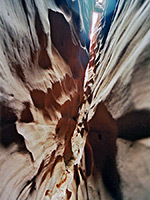 These are however quite difficult canyons to traverse. The upper ends of all slots are easily reached by a good but narrow dirt track that heads east from UT 95, 0.5 miles north of its junction with UT 276, about half way between mileposts 26 and 25; this climbs gradually up a sandy hillside then crosses a plateau (Cedar Point). After 4 miles, the track turns 90° left, at the top of a small summit (5,268 feet), which is a good camping spot - just a short distance west of upper Butler Canyon, at this point still quite a wide ravine through the Wingate sandstone. This is a possible base for the hike to the west fork canyons, though the closest parking place is about one mile further along the road. To reach Stair Canyon or the east fork of Butler, the road is followed several miles more, though it deteriorates and becomes very sandy in one place as it climbs almost to the top of Cedar Point (5,875 feet), following a ridge that overlooks all the North Wash canyons on one side and Poison Spring Canyon/Dirty Devil River on the other. 14 views of Butler Canyon. TopoQuest topographic map of Butler Canyon; the 2 westernmost forks are west of 5143T. The walk from the approach track across sandy, bushy land takes just 15 minutes from the closest point, down to the head of the left branch of the west fork. 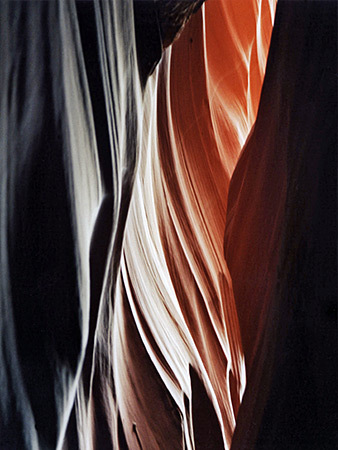 The slot starts quite abruptly, not particularly deep at first but with nice V-shaped passages through curvy rocks composed of thin strata with varying colors. The canyon is relatively open for a while with no overhanging cliffs and only minor obstructions provided by dryfalls and boulders but constricts and becomes gradually deeper until easy progress is interrupted by a smooth, near vertical drop of 20 feet into a thin, murky pool. This may be downclimbable but a much taller drop is not far ahead, and the far end of the slot is a only few hundred meters after that - the 20 foot drop is at least 3/4 of the way through the narrows. There is an exit point to the east a little way back, from which a short walk northeast, up and over a ridge, reaches the next canyon, the middle branch of the west fork. The middle slot, best of the three divisions of the west fork, starts where the wash drops over a bench then over fluted falls of 20 feet. Webbing is attached to an adjacent boulder to provide a belay point though it is easy enough to free climb down a few meters along on the east side. Below the falls are straight, shallowish narrows, quite enclosed from the start, with regular drops over boulders and small dryfalls. 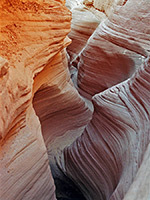 Rocks are varied in texture and quite pretty, formed of multi-colored strata, smooth in some places while other sections have knobbly intrusions. A few obstructions are problematic, especially if returning upcanyon so some may have to exit the same way. 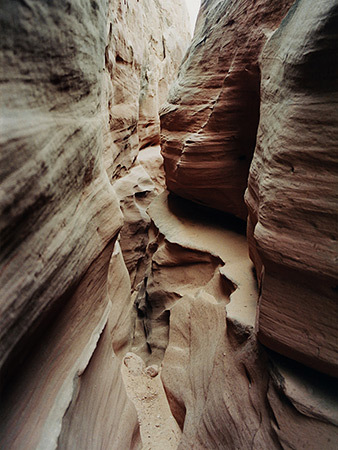 There is no other easy route to leave the upper canyon apart from the initial entry point. The slot may be re-entered by walking along the east rim then down a steep slickrock slope to the middle of a section where the drainage is temporarily open. Downstream, after a couple of drops into potholes there begins a good, lengthy, very tight slot, often slanted sideways, overhanging above and through more rocks with fine banded striations - quite enchanting, even in gloomy weather. 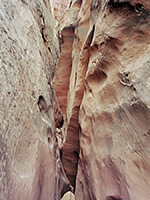 The floor drops downwards steadily over boulders and across small pools and the canyon is often too narrow to walk through at ground level. The passages relent a little after a rockfall then continue to descend steeply at intervals and soon become very deep and dark. As with the upper slot, at least one obstacle looks easy to climb over but maybe not to come back up so retracing steps may be the only option. Not far below this is one more entry/exit route, down a steep rock slide, but the canyon ends soon after (see photo), following an especially deep, narrow section containing several sheer drops.